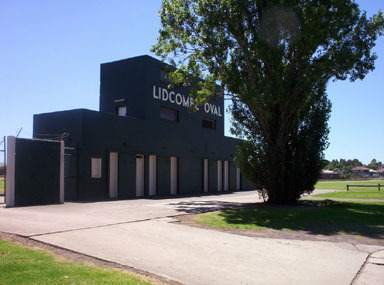 Lidcombe Oval……what can I say, home of the Magpies for 20 seasons. A ground steeped in West’s history. What follows is a true story!! 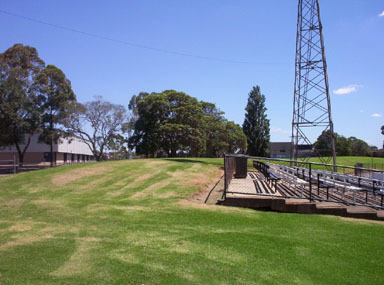 I sometimes drive past Lidcombe Oval along Olympic Drive on the way to my mothers and look across Wyatt Park and see the 2 giant goal posts pointing towards the heavens…. I still can see Tony Ford kicking a goal from his side of half way. ...Barry Glasgow kicking another field goal…….. Hang on, they're gone!! …..Must be my old black and white eyes playing tricks ….no there definitely gone. 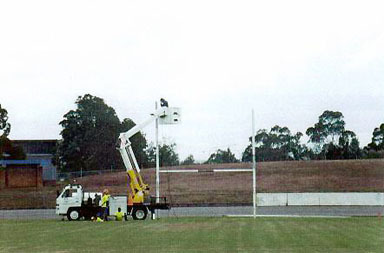 What has happened to tallest goal posts in the Southern Hemisphere? I decided that this was a story for Noel Kelly’s Kids. It could also be a story line for an episode of Blue Heelers. 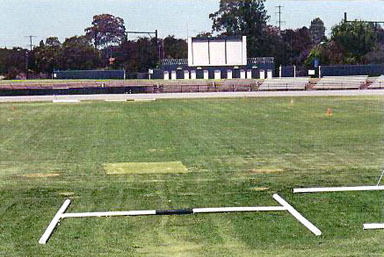 It seemed to me that the easiest way to get to the truth of the story would be to pay a visit to Lidcombe Oval on my next flexi day and ask some serious questions. I took my trusty camera with me and turned right off Olympic Drive into Church St something I had not done for almost 20 years. I can still remember walking down Church St from Lidcombe station all those years ago shoulder to shoulder with Magpie supporter’s black and white scarves around our necks. I still have that scarf knitted by my dear old mum but I digress...back to 2004. I parked the car and went through the big gates near the water tank. To my surprise the oval seem different…. 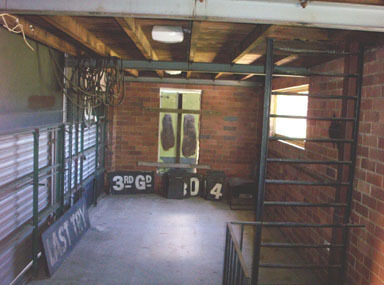 no giant goal posts, the grandstand had red and white seats, the shutters on the scoreboard were closed and no smell of Janson’s pies coming from the shop next to the grandstand. As luck would have it, I met an old Magpie fan called Phil Cluff. “Tony for you, access all areas”. As the photos show Phil was true to his word…. 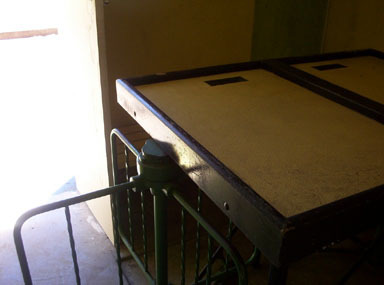 We went into the scoreboard building (it has 3 levels), the dressing rooms and into the press area at the top of the grandstand. You name it I saw it. But to tell you the truth my biggest thrill was to stand on the small hill where Greg and I stood together some 36 years ago. I could almost hear the guy that yelled out Commmmmm onnnnnnn West’s . He and his mate also stood in that area. 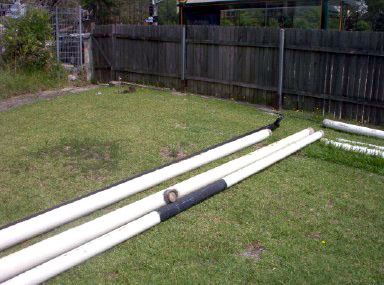 Hang on, “ What about the mighty goal posts?” I hear you say. Thanks. I had almost forgotten the reason I had come to Lidcombe Oval. Phil knew the answer of course…. 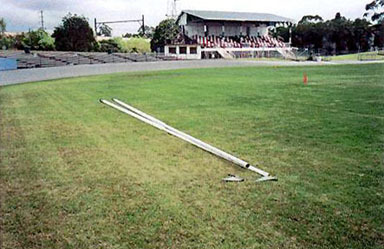 a soccer club had taken over the long term lease of Lidcombe Oval and one of the things that had to change to make it into a soccer ground was to get rid of the Rugby League goal posts. Phil had the foresight to bring his camera to work the day they brought the famous goal posts down. These photos are also in the slide show of Lidcombe Oval. So Phil were are they now???? One set of posts is now razor blades. The other set are in a secret location that only a few people know. But as luck would have it I was taken to this secret location and was able to take exclusive pictures of them. So there you have it. The mystery has been solved…. 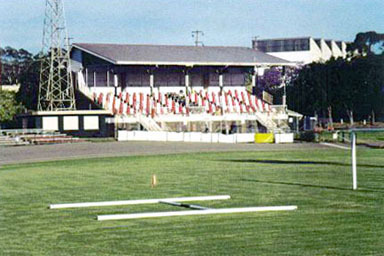 Before you check out the slide show that Greg has put together here is a little Lidcombe Oval history. Unfortunately I know very little about the history of Lidcombe Oval. 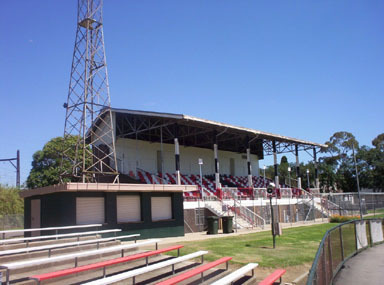 I know the oval was opened in 1933 because the plaque on the grandstand says so and that West’s had played there long before the official move from Pratten Park to Lidcombe Oval in 1968. 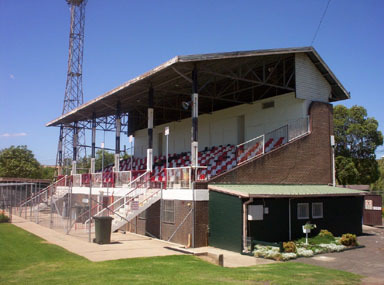 In that great book Bucket of Blood, Cloud of Dust, which is the history of Wests from the turn of the century up until about 5 years ago, it states that Wests played a first grade game there as long ago as 1941, because of the work that was happening at Pratten Park. 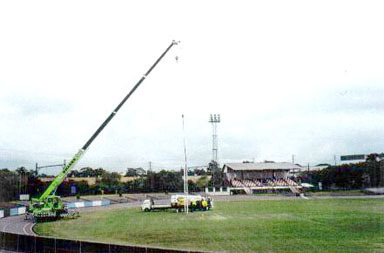 So if you have photos or stories about the early days of Lidcombe please feel free to email me with your information, it does not have to be about Rugby League e.g. I have some cricket history associated with Lidcombe Oval that was supplied to me by Mr. Richie Benaud. Richie was kind enough to check through old copies of Central Cumberland Annual Cricket reports and it appears that Grade cricket was first played there in the 1932-33 season (perhaps before the grandstand was built) until the 1956 –57 season. 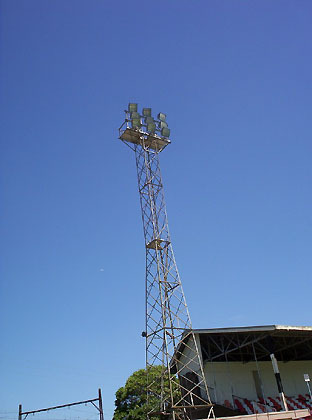 In the 1955-56 Annual Report a reference to the fact that floodlights were being erected so night football could be played. Richie has some good memories of Lidcombe Oval. He played his second first grade game for Cumberland at Lidcombe in the 1946-47 season, where he scored 40 runs and in 1949 scored 160 n.o. in an innings which gained him selection in the NSW team that year. And as they say the rest is history. 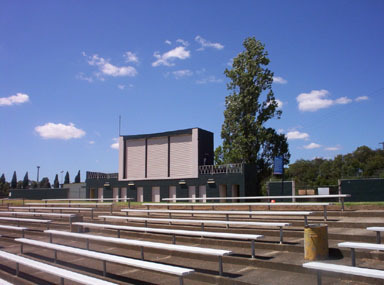 We hope you enjoy the pictures of Lidcombe Oval; it has been a pleasure to bring them to you. What a sight!!! 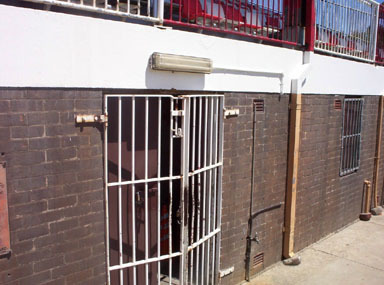 The entrance to Lidcombe Oval. 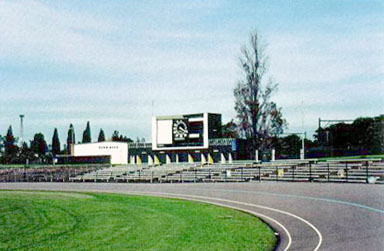 The scoreboard from the bike track. 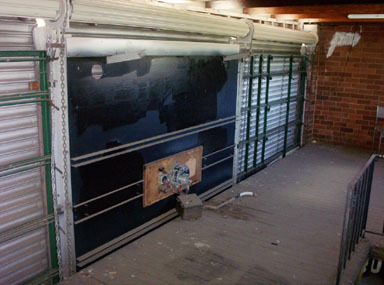 Inside the Wests change room. 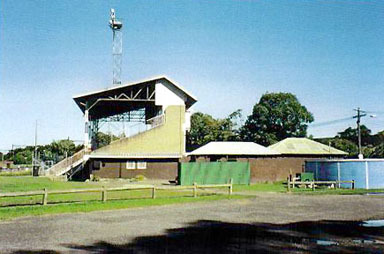 View of the grandstand from Tony and Gregs hill. 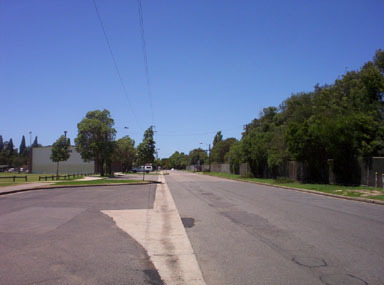 The long walk back to Lidcombe Railway Station. Have a look at the size of that crane. Just like Tamarama the tops are off!! Maybe not the tallest anymore. How about the longest! !